Yes, we actually have news! Two things in particular (ok, maybe three). 1. This Saturday, June 25th, Joel is preparing brisket and the fixings for local denizen, Don Robert’s 80th birthday party and community event. If you stop by, you can get a taste of what to look forward to next summer when we open the BBQ shack out here at the farm. We’re talking TX-style brisket here, folks! Deets can be found at Don’s blog RIGHT HERE! 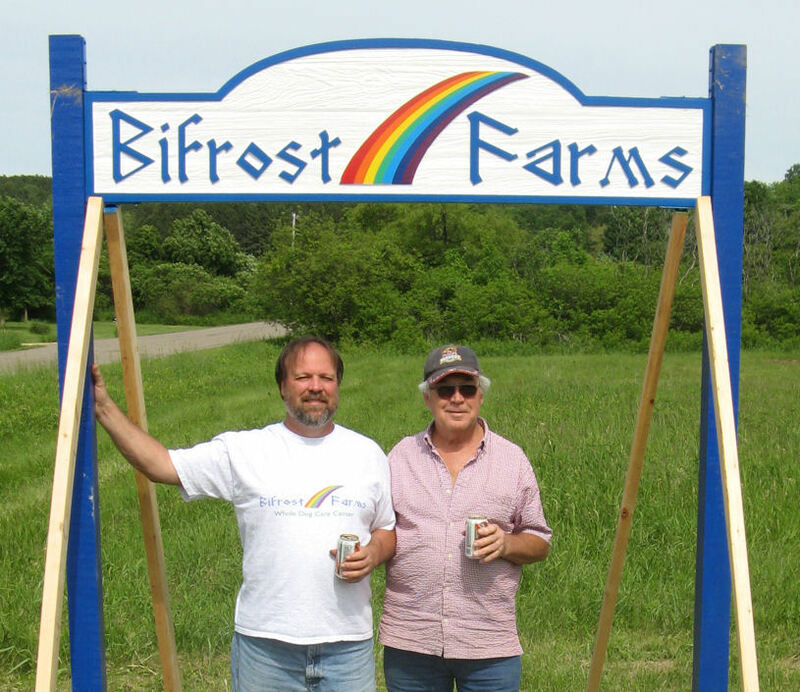 I’m really looking forward to seeing the Wisconsin premiere of Dirty Work, a video made by Deb Wallwork (who will be there) and Mike Hazard of Elsie’s Farm in Ridgeland. Lots of local organizations will also be around, making this a true old-fashioned event for the whole community. Come be part of it. 2. More in line with kennel news, we finally have a groomer!! YES! Can you tell we’re excited? Julie Schuler, formerly of Julie’s Fauna in Menomonie, is back in the saddle after another battle with cancer, which she has won. Beginning July 1 boarders and non-boarders alike can make appointments for a full array of grooming services. As a matter of fact, we’re already booking them! And not the least important is our new sign! Yes, now you can actually find us so much easier than looking for a kennel building off the driveway. 🙂 We’re stylin’ now, folks! 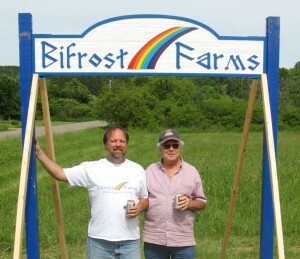 Joel and his dad enjoy a well earned cold beverage after putting up our sign.